It never dawned on me as I entered yoga for tennis just how tight I actually was. My shoulders, knees, hips, lumbar region – even my ankles were stiff. I had believed I was a pretty strong woman for 40’something. I’m not saying I’m a weakling but I quickly realized I had lost something. And for anyone starting tennis at this age you’ll want a lot of strength conditioning. On court I preach balance as if it were a birthright and to my surprise I was deficient in this as well. In fact my whole right side compared to its opposite was totally out of whack. God only knows what I must look like in a bikini?! To say I was humbled was an understatement. When I started believing in the benefits of Yoga I decided I was willing to cheat on tennis with yoga to empower my relationship. My strength, flexibility and muscle endurance deserved all my attention in order to remain injury free & continue playing in top form on court. I already had no real 1st serve anymore due to rotator problems. My knees were growing unsteady, my hips were on their way and don’t get me started on my sciatica. I was desperate to cure the imbalances and liked the idea of a speedy recovery post play. And for clients? I had to make them believers. Yoga could prolong their games!! Personally I liked yoga for tennis a bit more than Pilates because of the breath work. I don’t mean inhale up – exhale down – that was difficult enough to maintain during a posture but the breathing exercises like, kapalhbati & nadi shodana turned me into a barrel of concentrated calm! Wow!! Simple breathing techniques to trigger my mind to be still. Think of the possibilities before a match to find the zone. It almost felt like I was cheating in some way & getting away with it. Find your perfect Instructor … and your life will soar! I must ‘Out’ her because everyone should have the opportunity to experience Lisa Dougherty of Dimitra Yoga. A woman with 30 yrs in the fitness industry and 17 years on the mat. A lifesaver to many people. I had no idea her notoriety as a yoga instructor prior to meeting her and lucky me for the encounter. Gifted with a fantastic intuition regarding humans I knew she was another kind of special. I graciously handed over my flexibility, strength and balance and began the work. 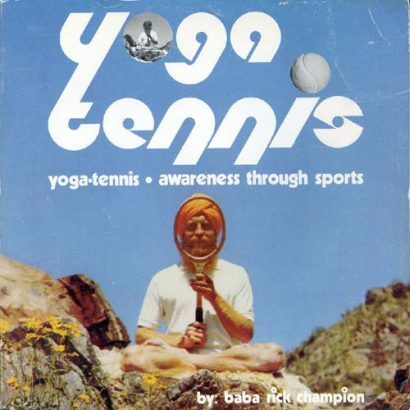 For tennis players wanting to excel at tennis yoga was a terrific gateway! The breathing exercises alone were a massive bonus! Either diaphragmatic breathing or alternate nostril breathing. Would breathing techniques help a player calm the nervous system before a match? Could you advise one in particular? Lisa Dougherty: Absolutely, breathing techniques offer us all a chance to calm the nervous system! It also offers a chance for exploration into awareness of our own breathing patterns and when practiced correctly can support the parasympathetic nervous system, reducing the effect of stress on our body and mind. Diaphragmatic and conscious breathing helps with present moment awareness, quiets and calms the entire nervous system, reducing stress and anxiety, bringing one into an improved self-awareness (zone). Are there beneficial postures for tennis players that can help gain flexibility, core strength and greater balance? Lisa Dougherty: Of course, there are many poses that can offer flexibility, strength and balance to tennis players. We can begin with Downward Facing Dog (Adho Mukha Svanasana) – It is a beautiful inversion offering balance for mind and body. It also stretches and strengthens. It targets the upper and lower body at the same time, feeling it in your hands, arms, shoulders, back, arches of the feet, calves and hamstrings. Chair Pose (Utkatasana) – works the muscles of the arms and legs, develops the core, quad and glut strength, protects the knee by building stability, opens the shoulders and chest. It also strengthens the supporting muscles at major joints, the shoulders, hips, knees and ankles. Half Lord of the Fishes (Ardha Matsyendrasana) – twists are refreshing for the spine, energizing. It builds strength and flexibility in the erector spine muscles, opens and stretches the hips, shoulders, upper chest and neck. Boat Pose (Navasana) – Offers abdominal and deep hip flexor strength. Tree Pose (Vrksasana) – Develops our focus and our breath and tones the muscles of the legs. There are many more; Warrior II, Triangle, Camel, Cat-Cow Movement, Pigeon. And when practiced with breath offer the chance to work both our inner and outer strength, as we search for focus, calmness and that meditative quality. Tennis is a very one sided sport and players often have asymmetries. Are there specific postures that could be good for ‘recovery’ after a match? Any ideas to balance both sides? Cow Face Pose is a beautiful pose for stretching the outer hips, shoulders and arms at the same time. It is an asymmetrical pose, which allows us very easily to feel the difference in the two sides of our body. It improves range of motion and stretches the rotator cuff. Crescent Lunge – Runners Lunge, with the back knee down or off the floor offer a great stretch for hip flexors, and they are a variety of arm positions that open the check shoulders. Supine Pigeon – Releases the outer hip, low back, IT band. Supine Twist – To release and stretch the spine. 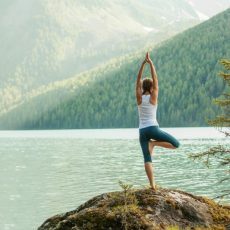 What is a yoga practice for tennis /athletes who tend to be more task driven, type-A folks – not necessarily looking for the spirituality aspect of yoga? Lisa Dougherty: Your last question is very subjective and personal. But, with a smile, we are all drawn to specific styles that seem to fit our personality. Very driven type-A students would enjoy the heat and repetition of Bikram’s 26 postures, repeated twice, or the beautiful Primary I Series of Ashtanga. Both disciplines offer a set practice that you can grow stronger and deeper with. Flow, Vinyasa and Power Flow all offer a great challenge that brings in great variety. Postures will change with the Intention of the Guide. Most of us really probably need to slow down to balance our very active lives with something a little slower, Restorative, Gentle or Yin.